Shopping for a new Hyundai Sonata? A 2019 Sonata SEL with automatic emergency braking offers tremendous value, from infotainment to power features to an exceptional warranty. The 2019 Hyundai Sonata knows it needs to jazz things up to draw eyes away from the crossover SUVs just across the showroom floor. Sedans have taken a back seat to utility vehicles, so the Sonata now wears a fancy front end, has five different powertrains on its order sheet, and dresses up in Limited leather, if you like. In 2018 Hyundai re-dressed the Sonata, and that sleeker form doesn’t change in 2019 (mostly because a new Sonata is on the way for 2020). With faired-in headlights that can be lit by LEDs, and an expansive six-sided grille, the Sonata’s certainly less drab than it was when it was last new in 2015. 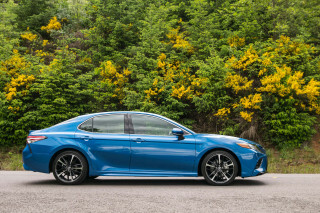 It’s standard-fare family sedan, though, and the cabin’s sheer avoidance of anything extravagant or overly expressive is telling. The space works fine, but the detail you’ll notice most is the touchscreen on the dash. Most 2019 Sonata sedans dip into the moderate power offered by a 185-horsepower inline-4, though some adopt turbo-4 engines for sport or for efficiency. The base engine’s fine, paired with a 6-speed automatic transmission, for fuss-free driving and an absorbent ride. No Sonata is sporty, but the turbo-4 in the Sonata Limited steps up the pace a bit, while leaving every hair in place. Sonata Hybrid and Plug-In Hybrids pair batteries and motors with an inline-4 for very good fuel economy and not much compromise to the admirably low-key driving feel. The latest Sonata has earned excellent crash-test scores, and automatic emergency braking comes on most trim levels, as a $1,000 option or as standard equipment. Base models have touchscreen infotainment, Apple CarPlay and Android Auto, and power features, while the Limited piles on leather upholstery, a hands-free trunk lid, and a sunroof. The 2019 Sonata barely registers on the excitement scale. Hyundai restyled the Sonata in 2018, after it launched a rather dowdy-looking model for the 2015 model year. The new one bears some more striking looks, but it doesn’t really offer much that a seriously swoopy Mazda or Honda already had. The details have changed since the 2015-2017 Sonata emerged to mixed reviews—which compared it to the showy, extravagantly different 2011-2014 Sonata, a breakout car for Hyundai’s styling department. Retouched for 2018, the latest Sonata has a stylish six-sided grille that cleanly tucks into the hood, and drops a low grille nearly to the ground. 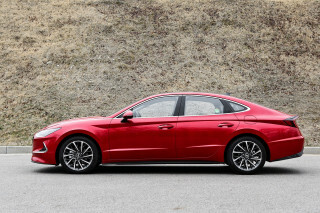 The roof is long, the profile is low, and from some angles the 2019 Sonata resembles a big hatchback. The interior’s been left behind, though. The presence of a big touchscreen atop the dash doesn’t really relieve its basic, plain theme. Some of us find that a happy occasion: The Sonata’s cockpit is blissfully free of the overstyled exaggeration of some sedans, and the controls don’t get stranded in odd places or take on odd forms as a result. Though the Sonata’s interior is attractive and cohesive, with buttons grouped together and plenty of redundant switches, it’s not particularly interesting. Moreover, it’s only available in rather uninspiring beige, grey, and black shades. A warm brown would help. The 2019 Hyundai Sonata comes up shy of true sport, but it’s all-day pleasant. The most common configuration for the 2019 Sonata—whether it’s an SE, SEL, Sport, or Limited—will be one that features a 2.4-liter inline-4 pegged at 185 hp and 178 lb-ft of torque. With direct injection, the big inline-4 sends its power via a 6-speed automatic to the front wheels. It’s a paragon of normality: Nothing this Sonata does is groundbreaking, from its linear and moderate acceleration, to its quiet-enough operation, to its fuss-free shift quality. There’s just enough power to give it moderately engaging feel, and the transmission does what it can to make the most of that, with quick shifts and a blissful lack of hunting, as most 9-speed automatics do in rivals. There’s a 178-hp 1.6-liter turbo-4 in the Sonata Eco, and we haven’t spent much time in it recently. Our first drive in a Sonata with that powertrain left us more impressed with the engine and its flexible power than with the 7-speed dual-clutch transmission, which felt jerky and overwhelmed at low speeds. Among the gas-only models, the “sport” branding is only a suggestion, and this year it doesn’t even apply to the Sonata Sport, which has identical suspension and steering settings to the lower-rung models. All of these Sonatas are compliant and rather softly tuned, with electric power steering that can filter off the worst of the road without an overwhelmingly artificial feel. The neutral, comfortable feel of a Sonata on 17-inch wheels is at its best on mildly challenging roads and decently maintained interstates. Base cars and Eco models with smaller 16-inch wheels have a slightly softer ride. The Sonata Limited gets a firmer tune, but only when it’s fitted with the 2.-liter turbo-4. It’s hardly rough, but it is notably more firm, and will jostle passengers a bit more when the tires slap across mini-craters in the pavement. The steering grows more heavy, which mimics road feel with its stronger on-center feel. It’s short of the handling virtue on full display in a Honda Accord or Mazda 6, but pleasant is no bad place to be. Hyundai Sonatas can be hybrids or plug-in hybrids—and if a greener profile is important, the plug-in math may work better. The 2019 Sonata Hybrid hasn’t changed in a few years. It pairs a 2.0-liter inline-4 with 154 hp to a 38-kilowatt (51-hp) electric motor that sits between the engine and a 6-speed automatic. Total system output of 193 hp is a notch above the base gas-only inline-4. A 1.6-kwh lithium-ion battery stores power under the trunk floor. The Hybrid’s batteries and motor provide extra torque for the gas engine, and the motor recharges the batteries when braking. It’s a smooth integration, with the automatic’s conventional gears lending a traditional driving feel free of the CVT-style drone and detached driving feel common to some other hybrids. The Sonata Hybrid can keep up with traffic easily, and drivers may be hard-pressed to tell when the engine turns on and off—since it can be shut off at speeds of up to 75 mph to enable a “sail” mode for better efficiency. But why stop there? The Sonata Plug-In Hybrid installs a higher-capacity 9.8-kwh battery, which boosts weight to 3,800 pounds (about 500 more than the base car, or 270 more than the hybrid). Our testers have seen fuel economy of better than 41 mpg once the hybrid battery pack is depleted—which comes after it delivers up to 27 miles of battery-only driving range. It can be recharged in about 9 hours on a household outlet, or in as little as 3 hours on a 240-volt outlet. It’s heavy and more expensive, but drivers who aren’t quite ready for a pure battery-electric car might find the Sonata Plug-In Hybrid an ideal stepping stone. The 2019 Hyundai Sonata suits tall front passengers and has good storage space, but the rear seat has some minor comfort issues. With the Sonata, Hyundai carves out a great deal of passenger and storage space from a footprint that’s in line with its family-sedan competition. There’s terrific space up front and a big trunk. However, the back seat’s not so easy to get into, and interior fit and finish is just okay. In the front seats, the 2019 Sonata puts passengers in comfortable chairs with plenty of adjustment; in most versions the seats are height-adjustable. The lower-priced Sonatas have cloth upholstery, and Sport sedans have cloth seats with leather-trimmed bolsters; only the Sonata Limited wears full leather upholstery. On the Sonata Sport, Hyundai adds even firmer cushions to snug in the front passengers, and they’re a great upgrade compared to the standard seats. It’s more difficult to get in the rear seats, thanks to a low roofline, but the Sonata serves up decent leg and knee room for two adults, and a third will fit for shorter trips. Most Sonatas have rear seat air vents and a USB port in back for passengers, and the rear seats fold down for trunk access. However, Hyundai’s dropped the option for heated rear seats, and tall passengers will rub against the headliner if they sit upright. With a big center console and door pockets, the Sonata can deal with all your small items, and has dedicated space for smartphones. The trunk’s 16.3 cubic feet of space can tote a few roll-aboards with space left for smaller items, and the cargo floor’s low liftover height makes it easy to load it full. Sonata Plug-In Hybrids have somewhat less space, and the trunk pass-through is considerably smaller. With its spare, clean look, the 2019 Sonata doesn’t offend anyone. Other sedans in this niche offer a more upscale appeal, in tone and texture, but the Sonata’s cabin seems well fitted and quiet enough for lots of highway miles. Very good crash-test scores in the 2019 Hyundai Sonata just need standard automatic emergency braking to feel complete. The 2019 Hyundai Sonata earns excellent crash-test scores and makes some necessary features available for a low cost—though we’d like to see them made standard. The NHTSA says with its revamped face, which came in the 2018 model year, the Sonata protects drivers very well. It’s rated at five stars overall, with only a slight blemish in a four-star rollover resistance rating. The IIHS calls the latest Sonata a Top Safety Pick+, with equivalent crash protection for both front passengers, and with good available headlights and accident-avoidance technology. All Sonatas have blind-spot monitors with rear cross-traffic alerts. 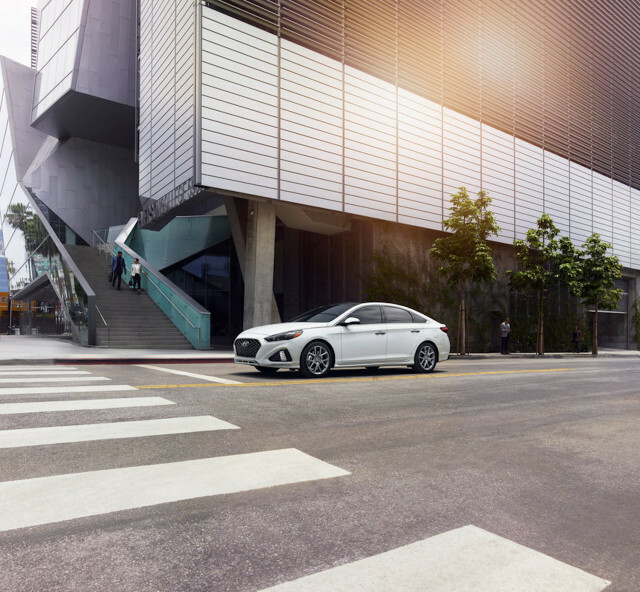 Hyundai will fit Sonata SEL sedans with adaptive cruise control, active lane control, and forward-collision warnings with automatic emergency braking for $1,000. That bundle’s standard on higher trims. A fantastic warranty and good standard equipment balance out the 2019 Hyundai Sonata’s relative lack of options. The 2019 Hyundai Sonata earn respect for the jumbo warranty it carries, and gets credit for its good infotainment system and its strong value. If it sported standard automatic emergency braking and more choice between features and trims, it’d be nearly perfect here. The 2019 Hyundai Sonata comes in SE, Eco, SEL, Limited, and Sport trim levels. The only major change for this model year comes under the hood: Hyundai no longer pairs its Sport trim with its more powerful turbo-4 engine. All Sonatas get standard power features, air conditioning, Bluetooth with audio streaming, and a 7.0-inch infotainment screen with Apple CarPlay and Android Auto compatibility. 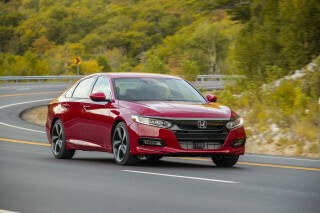 Each also gets a hefty 5-year or 60,000-mile bumper-to-bumper warranty, or 10 years and 100,000 miles of coverage for the powertrain, whichever comes first. Sonata SE sedans roll on 16-inch tires. The Eco has similar features, but gets power from a 1.6-liter turbo-4 delivered to the front wheels through a 7-speed dual-clutch transmission. At the SEL trim level, the Sonata adds 17-inch wheels, keyless ignition, heated front seats, and a 10-way power driver seat. Automatic emergency braking costs $1,000 here, and comes with adaptive cruise control and active lane control. The SEL with this bundle offers the best value to us; it’s our pick in the Sonata lineup unless fuel economy is the top priority. Sport Sonatas get leather-and-cloth sport seats, styling touches, a black headliner, and a sunroof, in what’s primarily a cosmetic package now that the turbo-4 isn’t offered on it anymore. The Limited can have the bigger turbo-4 and it gets cooled front seats, leather upholstery, and LED headlights. With an Ultimate package, it comes with the safety bundle as well as Infinity sound, smartphone wireless charging, navigation, and an 8.0-inch touchscreen for its infotainment system. At more than $33,000, the Sonata Limited Ultimate doesn’t offer much in the way of options, but it’s very well equipped. Hyundai sells the Sonata Hybrid in SE, Limited, and Limited with an Ultimate package. The SE largely mirrors the standard SE and SEL trims, while the Sonata Hybrid Limited adds a hands-free trunk release. Plug-In Hybrids come as a base model with a power driver seat, heated front seats, and navigation, and as a Limited with everything. The 2019 Hyundai Sonata’s fuel economy is at least average, even without the batteries. Hyundai sells its 2019 Sonata with plug-in, hybrid, and high-efficiency gas powertrains, but the most popular models draw power from a standard-issue inline-4. The best of the gas-only Sonatas is the Sonata SE, which rolls on 16-inch wheels. It’s rated by the EPA at 26 mpg city, 35 highway, 29 combined. In higher trim levels, without a turbo or hybrid batteries, it’s pegged at 25/33/28 mpg. The 1.6-liter turbo-4 and dual-clutch transmission in the 2019 Sonata Eco pull in ratings of 28/37/31 mpg, which would merit a rating of 6. 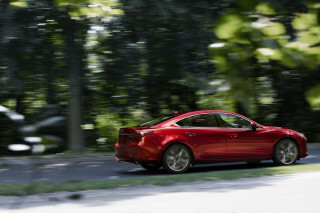 It’d be offset by the turbo-4 in the Sonata Limited, which the EPA scores at 23/32/26 mpg. 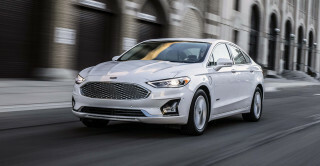 The Sonata Hybrid and Plug-In Hybrid haven’t been officially rated by the EPA, but last year’s numbers were 39/44/41 mpg for the Hybrid, and 40/46/42 mpg for the Hybrid SE, both of which would rate an 8. To get a score of 9, the Sonata Plug-In Hybrid would have to be the best seller. Rated at 27 miles of electric range, it’s EPA-rated also at 39 mpg combined when it runs on gas after the hybrid battery’s charge is depleted; before then it’s rated at 99 MPGe, a number the EPA says represents how far the Plug-In Hybrid could run on the energy held by a gallon of gas. Don’t get us started on that soon to be irrelevant measure. Looking for a different year of the Hyundai Sonata?